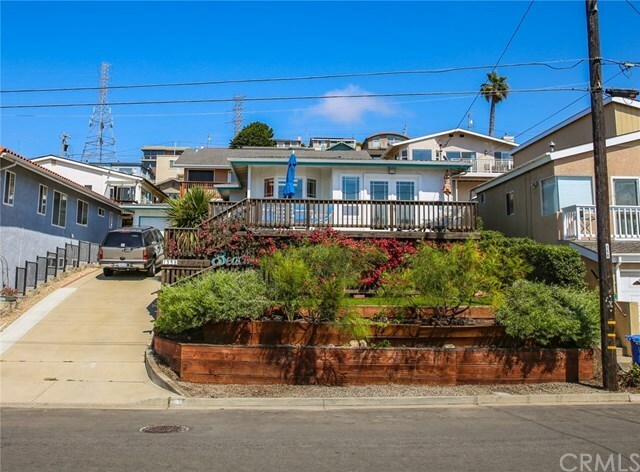 Ocean views & colorful sunsets await as you step into this quintessential Morro Bay Beach Home with terrific views of the rock. Located in the Harbor Tract, this charming 3 bedroom/2 bath single level home features an open floor plan which is perfect for entertaining. Custom appointments to include hardwood flooring, energy star refrigerator, tile showers, copper plumbing throughout, designer interior paint along with all new electrical outlets making this home truly turn key. A new roof & hot water heater ensure confidence for years to come. Relax on your expansive wrap around deck that's well suited for outdoor dining & taking in the fresh air & views. Bonus room with lots of natural light that's ideal as a game room or art studio. Single car garage offers storage for all your coastal toys & makes this property suitable as a primary residence or the perfect vacation getaway. Close to everything including a beautiful sandy beach, yet away from it all!